In the middle cottage of three named Latimer Cottages, in Freston, lived Mr and Mrs Chapman and their four children. On Tuesday 13 September 1910, the third child was taken ill. She had a temperature of 105°F, and over the next six days developed a cough which worsened. She became delirious and suffered with diarrhoea and sickness. She died on 16 September. On the 21 September, the day after her funeral, her mother developed the same symptoms and died two days later. Mr Chapman, and a near neighbour who had nursed Mrs Chapman, both fell ill and died on 29 September. This was the last outbreak of plague to occur in England and it is believed that this outbreak, along with two other later confirmed incidents between 1906 and 1918 in Shotley and Trimley, were the result of fleas from rats brought by shipping on the rivers Orwell and Stour which merge at the Shotley Gate peninsular. That was a hundred years ago, but nearly five hundred years ago the Tower was built. The purpose of this magnificent building is unclear although there are many theories including; a leisure house for the daughter of the owner, where she could participate in six different pass times (one for each floor) including astronomy from the top floor, a lookout tower against pirates, part of a pleasure garden and also, that it was built especially for the visit of Queen Elizabeth I's visit to Ipswich in 1579. 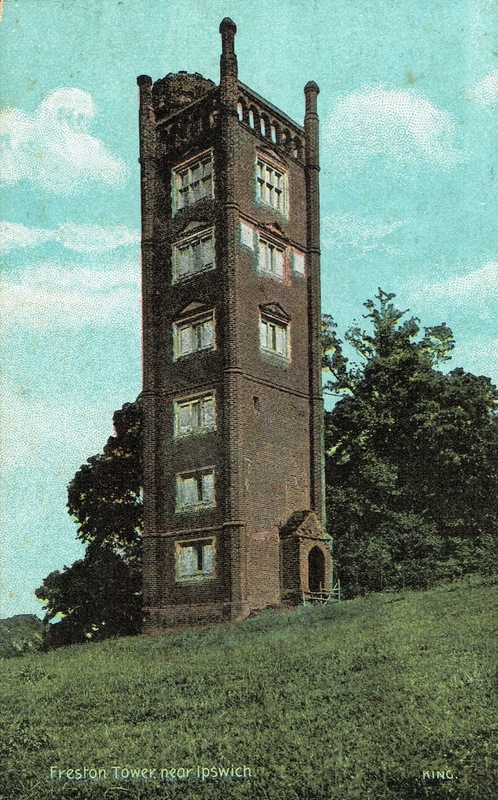 Through dendochronology it has been found that Freston Tower was built between 1578 and 1579 by a local merchant Thomas Gooding. And the most likely explanation for the building was that it was a folly (built entirely for decoration and no specific purpose), if so, it would have been one of the first in the country. When we visited the property on the Ipswich Heritage Open Weekend in 2012, there were volunteers on the ground floor who explained the history of the building and answered questions while we were waiting. Unfortunately, I can't remember the order of the floors as I had to take a quick snap when there was no-one around, which was quite difficult, so the pictures are in no specific order. The cosy living room. This was on the top floor. The views from the top of the Tower are beathtaking. The Tower has been restored by the Landmark Trust and is available to hire for short breaks and holidays. It really is a charming, quaint and unusual place to stay, as you can see, is it has everything you need for a holiday. The road from Ipswich to Freston winds along the river giving beautiful views of the boats, ships and the many birds which congregate along the the water's edge. The road also gives a close up view of the impressive the Orwell Bridge. The village used to have a lovely little pub The Boot, but unfortunately this has been closed for some time. Freston Tower is available to hire for holidays from The Landmark Trust. If you would like a walk near Ipswich, the Suffolk Coasts and Heaths website has a printable leaflet for a walk in this area called the Wherstead Explorer.